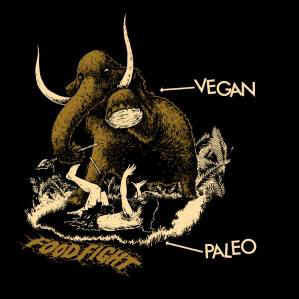 Time to address the paleo diet, as it is one of the biggest dangers to what most vegans deem perilous: the persistent torture and slaughter of billions of animals a year and destruction of our planet. Yet, people who try the paleo diet seemingly do well initially health-wise, which makes it appear all the more appealing. But the truth is that people may thrive merely because they are switching from the standard western processed diet to one that includes more whole foods. The diet promotes healthy vegetables, fruits, nuts, and seeds and they also cut out dairy and processed foods, which are all health-promoting choices. The major issue is the irresponsible emphasis on meat, meat, and more meat. Further, we have no long-term data on people eating this way, although the evidence on the risks of eating animal products is well-substantiated. Because there were multiple types of diets prevalent during the Paleolithic era (depending on location and food availability), great leaps of assumption have been made to suggest eating a meat-rich diet occurred at all. Many anthropologists suggest this argument is flawed. Two primary reasons for this include the fact that carbohydrates, found primarily in plant foods, are the preferred fuel for the brain and body and plant food availability was much more stable, accessible, and consistent, whereas animals were not. Even if the original paleo diet hypothetically looked as it is currently described, there are no health parameters that are comparable to our current culture to make it relevant to us now. Factors including lifespan (they lived to approximately 30 years of age), activity level, access to medical care, and overall food intake (they ate wild plant foods and animals, unlike what we have available to us today) are critical to consider when determining long-term health assessment. According to some anthropological experts, humans have not adapted physiologically, anatomically, or genetically to consume meat, especially in large doses. For example, the long length of our digestive tracts and type of teeth suggest a need to base our diets on whole plant foods. Research is consistent in finding associations between the consumption of meat and incidence of heart disease, type 2 diabetes, dyslipidemia, high blood pressure, metabolic syndrome, and certain cancers. 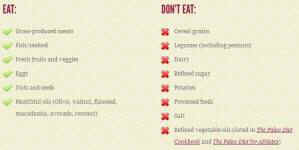 Further, meat eaters tend to have higher BMI’s, increasing risk for most chronic diseases. Plant-based eaters have lower overall mortality, lower cholesterol, lower cardiovascular disease mortality, better blood sugar control and the ability to reverse type 2 diabetes, and possibly less cancer. People thrive with whole grains and legumes, which are excluded on the modern paleo diet. Whole grains and legumes provide fiber, phytochemicals, vitamins, and minerals that are crucial for satiety and to meet nutrient requirements. Animal products contain zero fiber or phytochemicals, two of the most important nutrients for optimal health. Grass-fed or organic animal products still contain hefty doses of health-damaging saturated fats and dietary cholesterol, naturally occurring hormones like insulin-like growth factor 1 and heme iron, which promotes cancer growth. In order to sustain a large portion of the world on a paleo diet, we would need the resources of 2 Earths. Eating a large portion of calories from organ meats, grass-fed, and organic meats is extremely expensive and challenging. Compare organic beef, which costs $5.25 per pound to beans, which cost about $1.99 per pound, dried, which makes about 8 cups cooked and can serve at least 8 people. 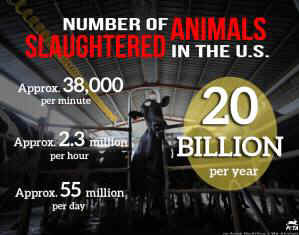 Eating animals contributes to the unnecessary horrific cruelty and animal suffering of billions of animals a year. We absolutely do not need animal products to survive. All nutrients from animal products can be found in plants, but better packaged. The only exception to this is vitamin B12, which the animals get from microorganisms in dirt. 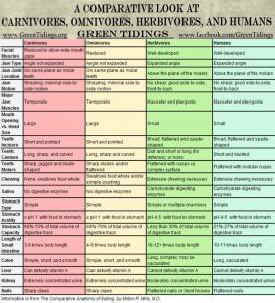 Not only do vegans get enough of all essential nutrients, we tend to meet nutrient needs better than omnivores. The Academy of Nutrition and Dietetics shows the plant-based diets meet all of our nutrient needs.